This is the first book I’ve read for the 20 Books of Summer Challenge 2016 – and it’s a good one. High Rising by Angela Thirkell has been on my TBR list for 2 years so it also counts for the Mount TBR Reading Challenge. It’s an entertaining and witty social comedy, set in the fictional county of Barsetshire, borrowed from Trollope, in the 1930s, and originally published in 1933. Laura Morland is a widow with four sons, who supports herself by writing novels, which she knows are not ‘in any sense of the word, literature‘ but which have appeal. She lives at High Rising and her friend, also an author, George Knox and his daughter Sybil live at nearby Low Rising. Her youngest son, Tony, an exasperating character, who talks non-stop about his passion for trains, is still at boarding school, where Laura’s friend, Amy Birkett is the headmaster’s wife. The other main characters are Adrian Coates, Laura’s publisher, Anne Todd, Laura’s part-time secretary, Dr Ford, and Miss Grey, George’s new secretary. Their comfortable lives are disrupted by Miss Grey, who having no relatives she can go to, is on the lookout for a husband. It began slowly for me and I wondered if I was going to like this book, thinking maybe it would only be a 2, or possibly a 3 star book on the Goodreads rating scale. But it grew on me as I became drawn into the 1930s world of rural England, with its servants and social structure, where everybody knew their place. 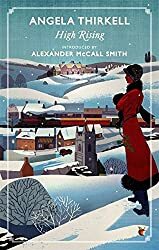 As Alexander McCall Smith in his introduction writes this is not in ‘Wodehouse territory – Thirkell’s characters do have jobs and they do not spend their time in an endless whirl of silliness.’ By the middle of the book I began to think it was a 4 star book and by the end, even that it was maybe worth a 4.5 star. Affection for social comedy is not something we should have to apologise for, even if that sort of thing is eschewed in the contemporary novel. Such matters may seem unimportant, but they say a lot about human nature. Above all, though, we do not read Angela Thirkell for profundity of emotional experience; we read her for the pleasure of escape – and there is a perfectly defensible niche for escapist fiction in a balance literary diet. The emphasis is mine – and I like the description: ‘a balanced literary diet‘, another way of saying that my reading tastes are eclectic. This is the first of Angela Thirkell’s books that I’ve read and shall certainly search out more of hers to read. She wrote nearly thirty Barsetshire novels as well as other works of fiction and non-fiction. For more information about her see the Angela Thirkell Society (UK) and the Angela Thirkell Society of North America. I’m not sure how many ATs I’ve read now… half a dozen possibly. There are *loads* and so far I’ve enjoyed every one. They’re charming and I just love the humour, so understated and with pin-point accuracy. So pleased you liked this one… they get even better I assure you, I adored August Folly. I’ll look out for August Folly next! I liked the understated humour too – made me smile or chuckle rather than laugh out loud. And I liked the literary references too. Very glad you enjoyed this, Margaret. It’s interesting, isn’t it, how some books do just grow on you as you read them. That’s happened to me, too. You have a lot of treats ahead of you! I especially love the wartime books and those dealing with the austerity of post-war Britain. I read this one and one other by Thirkell and am now a fan of her writing. Ah, beloved Barsetshire, and social comedy.